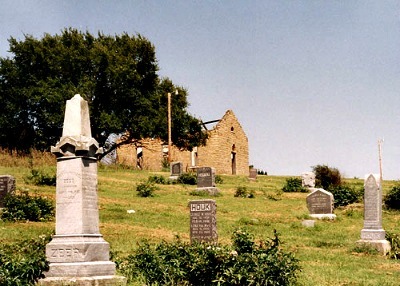 Stull cemetery and church was built in 1867 on land donated to Stull by Jacob Hildenbrand. The village was populated by families of German descent and the church even held sermons in German up until the year 1912. The area was originally known as the Deer creek community but was renamed to Stull in 1899 after the first and only postmaster in the village who was called Sylvester Stull. The village remains very small to this day and doesn't hold much to attract visitors to it, also the stone church on the cemetery grounds was destroyed in 2002 by a local man who became annoyed at the stories about the hauntings there and tried to stop people coming to see if the strories about the hauntings are true. The cemetery itself is said to be a very haunted place, bordering on evil. The cemetery has come to bear the name of the gateway to hell and its believed that there are some secret stairs within the grounds which lead directly to the nether world. It is widely thought that Stull contains one of the seven gateways to hell. It is said that these stairs pull people down them as they descend, and they are unable to climb back up and are never seen again. Also an inexplicably tall tree which is said to have been used to hang witch's from before the land was turned into a cemetery is thought to be responsible for the activity here, as people have claimed to have seen the apparitions of witch's dancing around the bottom of the tree, though it was cut down in 1998 the day before Halloween to try and deter people from coming here in search of ghosts. The area certainly has the classic makings of ghost stories in the form of tragic events that occurred here. The following two events are officially documented and are a sad fact of the villages history. Firstly there was a farmer in the early 1900's who burnt one of his fields to clear the land, only to find the charred remains of his son lying on the soil. This is thought to be the reason the field has a classic ghostly mist and shadowy figure which appear from time to time. The second story is about a local man who was reported missing for several days until he was found hanging from a tree in the Stull woodland. People have again reported apparitions of this man and a very uneasy feeling when walking through the woods after dark. It is very clear that the residents of Stull have become quite annoyed with people who come to their quiet town and stroll around their villages cemetery. There are reports of people being physically chased out the area, sometimes for a number of miles. Whether this is because they know something about the area they don't want people to find out, or they are just fed up with people disturbing their quiet little village is unknown.